Everybody’s a wee bit Irish on St. Patrick’s Day, so break out the food coloring and celebrate with some tasty green treats! More St. Patrick’s Day ideas and free St. Patrick’s Day printables can be found here! Shop for personalized St. Patrick’s Day paper goods and printables here. 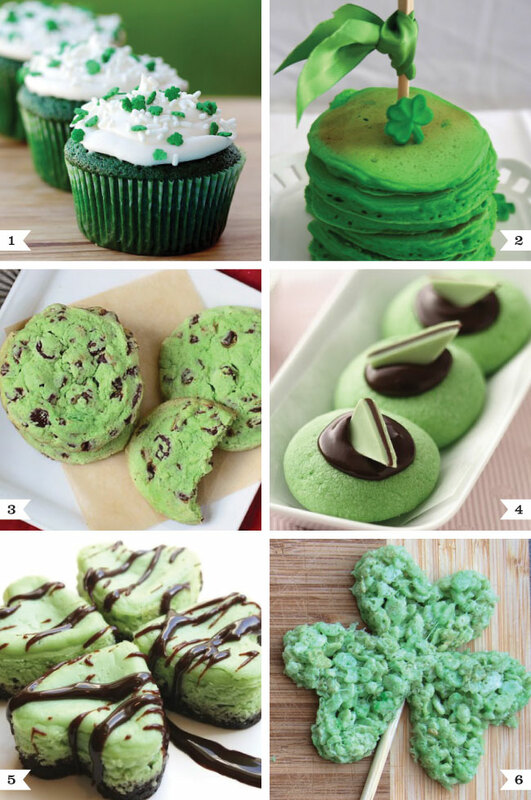 Or, check out more St. Patrick’s Day ideas on Pinterest or here on my blog! We always do green eggs and ham for breakfast! Great food finds! I love the Andes mint cookies...may have to actually try those myself! We didn't have any real traditions for St. Patty's Day growing up, but my new one will be to make these Thin Mint Truffles! They are AMAZING! What a great line up of fun ideas. Thanks for including my mini cheesecakes. Gosh these are all so cute! I found this on Pinterest and just needed to come by and say this is a fantastic idea! =) You have great taste! Can't wait to try the Green Velvet Cupcakes and the Mini Mint Cheesecakes! Great post! I love all the stuff you picked. I found you on pinterest and I'm featuring you as my pinterest pick at my Friday Favorites party this week! Come by and check it out! No family traditions; although we will be starting one this year! Our little guy is 10 months and I'm looking forward to the St. Patrick's Day celebration. We'll be wearing green (of course) and making those cool green pancakes. I am going to try to do the shamrock rice krispie treats, but my kitchen doesn't like when I cook with marshmallows. They may turn out to be egg-shaped. Thanks for sharing this list! Rice Krispie treats really can be hard to deal with sometimes, can't they?? No matter how many times I make them I'm always surprised how sticky the mix is when it's hot! I love the green food and will be making #4! Your blog is a favorite of mine! You're so welcome Kori! : ) I have a St. Paddy's DRINKS round-up to come, too! My family tradition for St. Patty's day is green milk. Which would go great with the green eggs. I also add green dye to the toilet water and tell my kids the leperchan had to use the bathroom before he left our house. LOL. We put green coloring in EVERYTHING! Mac and Cheese, Chocolate milk, etc.! This is the first time I'll be home with my daughter on St. Patrick's Day morning (I work full-time and go to school full-time) and I'm so excited to make all things green for her! Thanks for the ideas! SUBSCRIBE to our VIP newsletter for free printables! Thanks! Check your email for your free printables! Pink Golf Party: Blakely is 4!